The “fly” button is third from the left on the second row. The “land” button is cunningly hidden behind a removable panel in the rear lavatory. The rest control the in-flight-movie. The aviation industry is one plagued with red tape and strict process, and not without good reason. With more than half of all plane crashes caused by pilot error, and the flying public unwilling to fly without pilots in the pointy end, aviation authorities are doing everything they can to turn the cockpit into a robotic, process-driven office. Take-offs and landings are extremely busy times for pilots. Besides being the cool, calm head there to deal with emergencies when they happen, take-offs and landings are where they really earn their money. 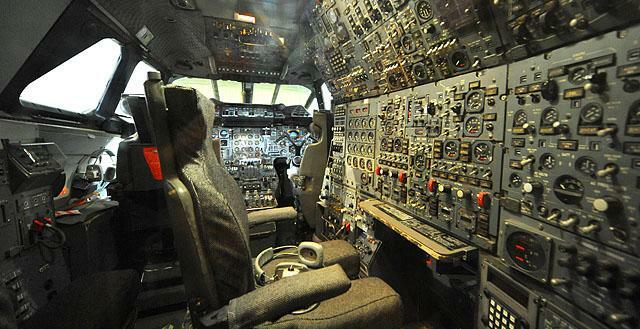 Under 10,000-feet, airline pilots must obey a concept known as the “sterile cockpit”; that means they aren’t allowed to discuss anything except the job at hand. Checklists, departure or arrival routes, weather and radio communication with air traffic control, that’s all, nothing extraneous. And you can tell when you’ve climbed to 10,000ft even as a passenger, it is usually signified by the pilots turning off the landing lights (the bright white lights in the wing roots) and turning off the fasten-safety-belt lights (as weather permits). The language used by airline pilots has evolved over decades to become very strict and specific, and not without good reason. The deadliest aircraft accident in history (besides 9/11), where two fully-laden 747 collided on Tenerife’s Los Rodeos airport’s runway in fog in March 1977, has been put down to a misunderstanding of terminology. 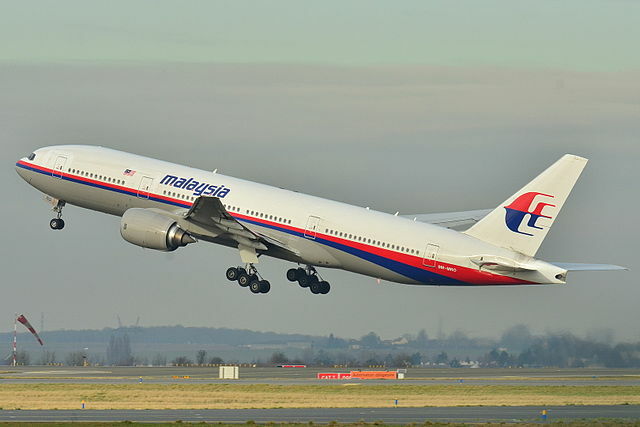 I know as soon as I post this the wreckage will be found and I’ll look like a mug, but I had a theory bubble to the top of my brain which might explain where Malaysian Airlines Flight 370 is, and why it disappeared. The Subang Air Traffic Control Centre lost contact with the aircraft around 01:22 local time. The aircraft hasn’t been heard from or seen since. No mayday call went out. Both ADS-B and secondary radar returns stopped at the same time. Primary radar returns from a nearby military radar station reportedly shows the aircraft turning back for land before vanishing. The Boeing 777 is a aircraft with a remarkable safety record. A technical failure is highly unlikely to have happened because the 777 has multiple, redundant systems. A fuel-tank explosion like that of TWA800 is now impossible due to a process of “inerting” where nitrogen is pumped into the empty space left behind when fuel is used up – meaning you can’t get enough of an “air-fuel vapour” to reach flashpoint. A missile strike would have caused a primary radar return, and also a flash in the sky. The US National Reconnaissance Office admitted it has full-globe capabilities for watching for flashes – typically used to identify the launch of intercontinental ballistic missiles. They say they didn’t record any flash. On Saturday morning Asiana Airlines flight 214, flying from Seoul-Incheon in South Korea, crash landed killing two passengers. This marks the first fatal Boeing 777 crash in its 20 years in service. 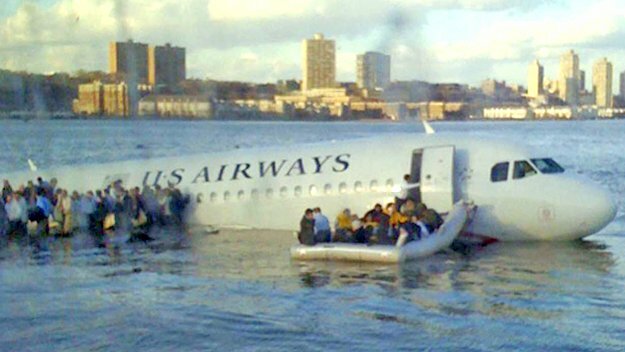 Eyewitnesses say the aircraft was low on approach and had a very nose-high attitude right before the tail struck the sea wall at the end of runway 28-Left (28L). 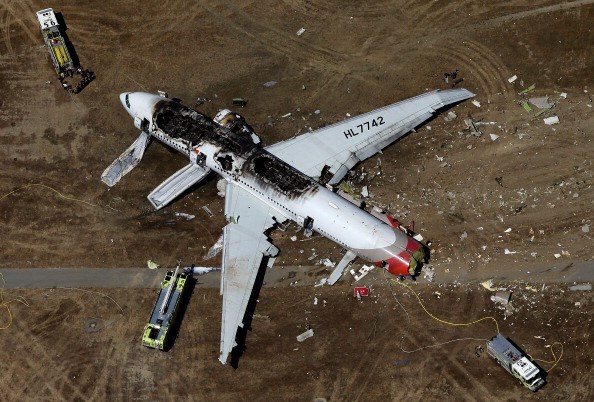 The tail section sheared off along with at least one strut from the main landing gear, which is visible in the pictures from the beach. Immediately this resembles the British Airways flight 38 crash landing where a similar Boeing 777 crashed at the end of the runway at Heathrow, however there are several factors that suggest the causes here are different. The BA038 incident occurred after the aircraft had flown through some unusually cold air causing water in the fuel to turn to ice. As the aircraft approached Heathrow, the relatively warmer temperatures closer to sea level caused some of the ice to be released into the fuel pipes. This ice hit a system known as the fuel-oil-heat-exchanger (FOHE for short) and solidified. This caused a dramatic reduction in fuel flow to the engines and a lack of thrust. The rest is history – the aircraft hit the ground with so little forward momentum that it stopped almost immediately but hard enough to drive the landing gear through the wings. 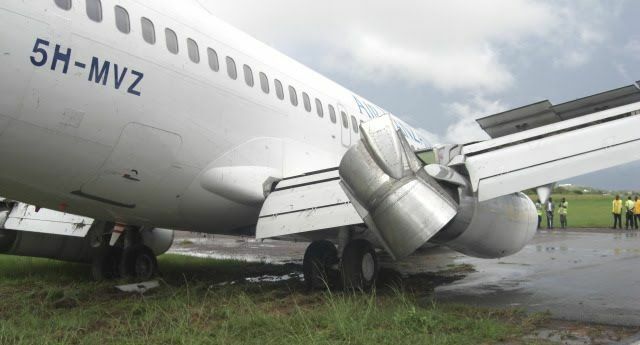 That’s how they are designed – you want your landing gear to fail before the wing fails! BA038 bellied onto the end of the runway and everyone escaped unharmed (except for some minor injuries picked up by sliding down the escape slides). But this appears to be a totally different problem for one critical reason: the engines on the Asiana Airlines, and associated fuel systems, are different. The FOHE issues that hit the BA flight are specific to the Rolls Royce Trent 800 while the Asiana is equipped with Pratt and Whitney PW4090 powerplants. Personally, I think it’s fairly obvious what has happened here. But I may be wrong. 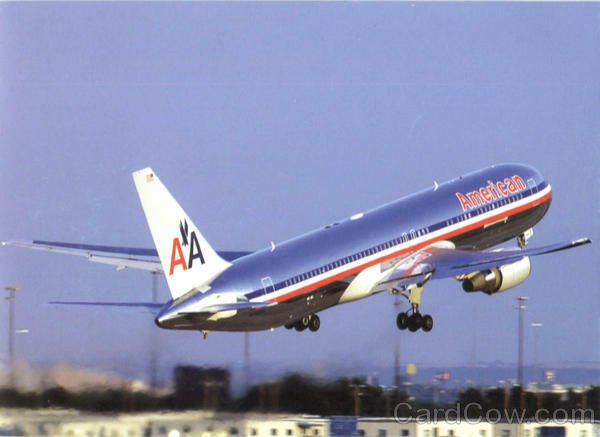 Today, after months of speculation and guesswork, the world finally got to see American Airlines’ new livery. Doing away with the bare-metal, full-length stripes and the “AA” with an eagle in the middle, the new paint scheme will work on the new all-composite aircraft coming out of Boeing and Airbus, which simply don’t allow for that “bare metal” look. (They’re not metal for a start!) The new livery is getting a mixed reaction, some love the new, modern style, while others think it is sacrilege to play around with such an iconic brand. The last time American got a new look was back in 1968, so this is an historic day in aviation. Its timing is telling of just how the company wants to leave its old image behind as it claws its way out of Chapter 11 bankruptcy protection. The question they should be asking is, of course, “does anybody know how to LAND a plane?” Flying is easy. Landing is hard. It is every Flight Simulator geek’s dream to be asked into the cockpit to save a pressurised tube full of terrified holidaymakers. But faced with an actual 40-ton flying shard of impending death, could you actually do it? Peter un-paused the sim and I guided the plane down as I had practiced at home. The VSI needle read -750 feet per minute, a nice gentle descent down the glideslope (GS). However, I was used to automated call-outs and this aircraft was designed about 30 years before they were added to aircraft. I kept the 737 on the centreline, aimed for the touchdown zone (marked by large white rectangles painted on the asphalt) maintained 750ft per minute descent until I guessed we were about 50ft off the ground then I closed the throttles and pulled back on the yoke to soften the landing. 737-200 in Britannia colours. Britannia are now part of the TUI group. Last weekend I traveled to Harrogate in Yorkshire to try my hand at flying the Boeing 737-200 airliner. Hidden away in a hangar on the outskirts of the beautiful (and quite historical) town is Real Simulation, a company selling flight simulator experiences in their full-motion 737 and F4 Phantom sims. As the old bare-metal livery “departs”, the world waits to see what the new one looks like… as it approaches… and lands. Or something. Yay, planes! American Airlines have announced they will change the polished-bare-metal livery their aircraft have sported since the 1930s. There have been several leaked designs and even a purported photo showing a new Boeing 777 painted in dark grey ready to be the first to receive American Airline’s new livery. Being British, and living the entire length of England away from London Heathrow, I don’t get the opportunity to see many American Airlines aircraft, but they always stand out when I do see them. The last one I saw up close was at “MDPC/PJU”, also known as Punta Cana Airport in the Dominican Republic, on the Caribbean island of Hispaniola. It was a 757-200 that was doing a trip from Kennedy Airport in New York, and back. It was beautiful. The scorching sun turned the entire fuselage into a massive ball of flaming light. Incredible. Compared to the white Spirit Airlines Airbuses and our First Choice 767-300ER, the AA jet really stole the show. The bare-metal livery has some advantages. Paint isn’t weightless – and saving 200 kilograms of weight on every flight means you get to carry a couple of passengers for free, compared to the competition.